Boston Marathon Race Details: Luckily I found Sam in the hotel elevator the night before the race. I didn’t have any safety pins for my bib. I ran with Hilary who had asked earlier that we run by feel; although, I had done this last year, feeling my foot for 7 miles. Hilary didn’t want me to bring my watch. So the rule was no looking at my watch. I had to have my watch to see my race results in great detail over and over again after the race. She didn’t care how fast we ran, yet Hilary wanted to break 3:50­her BQ. 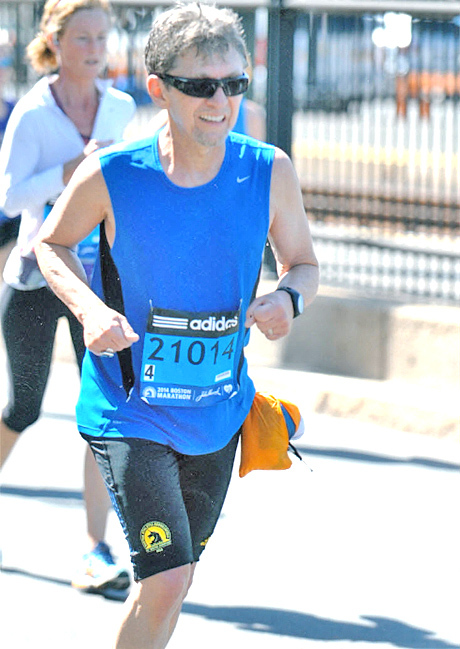 I wanted to shake off all my Boston emotions and I got past mile 7 without crying (last yrs. ending point). My next goal was to smile and enjoy every community. I did kiss some girls at Wellesley as did Hilary. When we got to mile 23, I did glance at my watch. I wasn’t smiling that much by then. I told Hilary to take off if she wanted a strong finish. I just wasn’t feeling right and she needed to stay on pace to BQ. I didn’t mention her time. She said are you sure? I was very thankful that she agreed to go on her own. The heat was getting to me. We had stopped to throw water over our heads for the 18th time and spit out some Gatorade. That stuff was getting nasty. I had a little stitch in my side since Newton. After the race, a short visit to the medical tent confirmed my feelings about not overdoing it. Had too little salt and a slightly high temp. Hilary made her BQ in the shade. BTW, Hilary’s race club was all along the course. One of the guys ran us up Heartbreak. At the time, I thought there must be more hills including heartbreak. Luckily I was wrong. My Boston BQ was still 18 min. under with my lowly 3:51:24. I had already qualified for 15′ at Big Cottonwood by 28 minutes. So will I go next year: that is the question. The Boston course is mostly downhill and I like it. But it is hard travel across the country for a race. I would recommend staying near the start. I didn’t have to get to the staging area until around 9:45. Last year it was 7:30 after an hour drive in the bus. It is cheaper too, way out there, but you do miss all the downtown action. Other details: The Newton Hills aren’t much to a western runner. 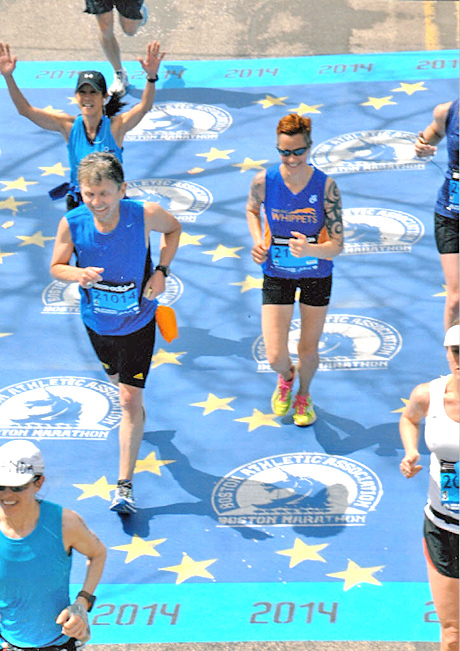 The Boston Marathon Volunteers you are the best! 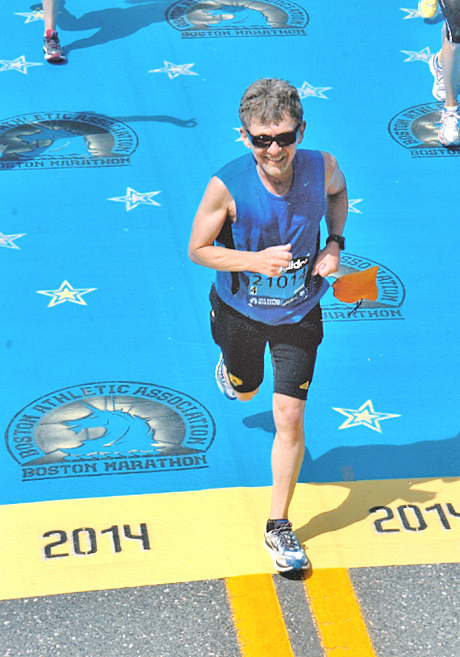 What crazy, wild, supportive, and caring Bostonians we had along the course. On my short visit in the Medical tent I was just as impressed with the volunteer medical staff as my longer visit last year (Plantar Fasciitis mile 7). It was an emotional experience both years, but this year it was joy. I was almost smiling the whole way­great down hills. On Sunday Brenda Jensen picked me up to show me Newton hills. She now runs with the Newton Striders. She had a “Kelly Heartbreak Hill story” that was great. Vinnie Kelley said there is another side to that story. Brenda was injured, but like so many of us wanted to run the marathon anyway (Jane Farris). Brenda had a 3:12 BQ last year at age 47. She has Plantar Fasciitis and glut injuries this year and finished again. I ate lasagna the night before the race. The lasagna was way too rich perhaps too much cheese and sausage. This scared me all night. The whole next day a little upset stomach thing going on. Never eat something new the day before a race! (Ha) Also new I got up at 12:30 am and had a little oatmeal. I believe Vinnie has shared this tip with me. If you can eat carbs at least 12 hrs. prior they will help during the race. I didn’t start the race until 11 and had eaten last at 6. I had 5 jells one prior to the race. Hilary was a great jell monitor and running partner. She would say “want to run another 5 k” every time we finished one. Hilary tried to get me to take off a number of times throughout the race, but I had declined. It was fun to cross all the markers together. She also writes a better blog and may have some better race details. 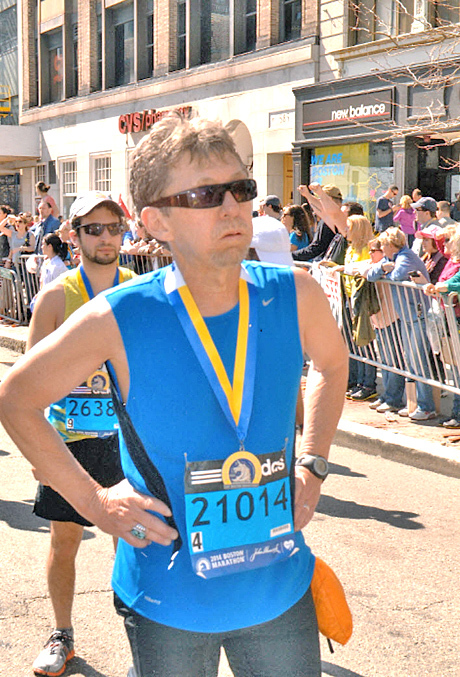 After the Boston Marathon… The medical tent was actually closer to the Boston Back Bay Station than had I not visited. I passed up the opportunity to meet Alexie Rothman & her friends at the Five Horses as I was worried I would get lost. I was still having problems understanding the local dialect and directions. My misunderstood pronunciation of Natick said “Naydk” or Worcester pronounced “Wooster” might end me up on the wrong side of town. After leaving the Expo on the first day I only had a small window to get to my train but was sent to the wrong track. It was only Xianna, U-Conn journalism major and I who were willing to wait by the track for two hours for our train. She was going to visit a friend who was meeting her in Wooster and was already in trouble for missing the first train. Her phone’s battery was dead and she wasn’t going to take a chance on missing the next one. She was just as confused coming from Connecticut as I was from New Mexico. This was comforting. After passing up eating at the Five Horses I had an $18 post marathon hamburger with salad at the SkyBoxk Gastro Sports Bar. This convenient Bostonian sports media center had hockey, basketball, billiards, and even soccer. Patrons would come in team outfits, bring their children to watch games and even the Boston marathon staff were there refusing an interview with a local TV station. I became familiar to the staff as it was right next door to the Hampton Inn. This was reminiscent of my recent visit to the Three Affiliated Tribes in North Dakota. There I had meals at the 4 Bear Casino Cafeteria in New Town. The food was good and you had an opportunity to experience the local culture. My prearranged 5 am Cab to the Logan Express was 50 minutes late. An accountant from Chicago and I watched another large cab with room for us leave the hotel 40 minutes earlier. Our Cab finally arrived and dropped us off with only 5 minutes to spare. New rule if a Cab is available take it. I must have picked up something on the 6 hour plane trip home, but all better now.